Here’s what’s up in the world of TV for Wednesday, February 29. All times are Eastern. Top Chef (CBS, 8 p.m.): It’s Leap Day, everybody! You remember Leap Day? The extra day you get every four years? The one that’s supposed to be there to set our clocks right, so we don’t get too far ahead of the sun or whatever? The one on which you’re supposed to set one old wrong right, pet one stray cat, and adopt at least one Dickensian street urchin? 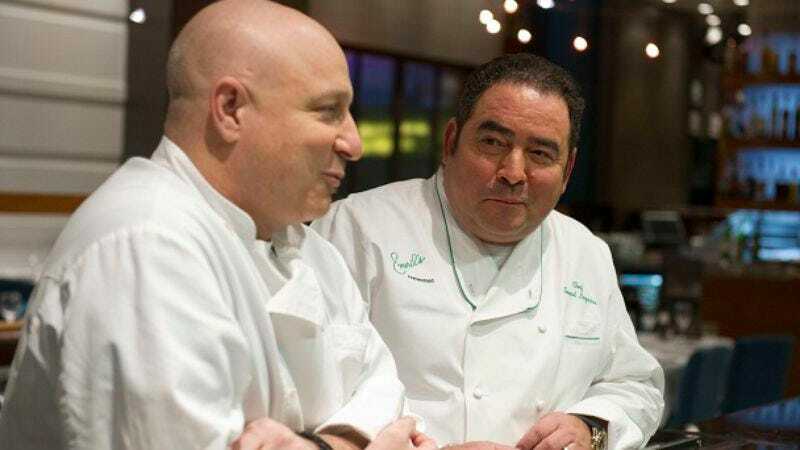 Well, Bravo has also scheduled the Top Chef finale for today, just to give you a television event that feels particularly momentous, because what’s a Leap Day without a major reality franchise offering you a season finale? Emily Withrow will be there for the end of Top Chef: Texas, and the show will be in British Columbia as always. American Idol (Fox, 8 p.m.): Last night, they let the guys sing. Tonight, Ryan Seacrest and his merry brand of pranksters unleash the girls on the world. Will the show recapture its cultural dominance? Or will it continue its slow slide into irrelevance? How about… both? Claire Zulkey votes for that option. The Middle (ABC, 8 p.m.): Mark this as the second comedy episode we’ve covered this February about a character finally getting to celebrate their “real” birthday after having been born on Leap Day. Previously, it was Parks & Recreation’s Jerry. Tonight, Will Harris celebrates with Slammin’ Sue Heck. Survivor (CBS, 8 p.m.): Tonight’s episode description includes a mention of a terrible rainstorm and a “frustration-filled discussion.” Are there any other versions of these things on this show? Carrie Raisler doesn’t quite recall the episode with gentle rain showers and quiet talks filled with “I feel” statements. Suburgatory (ABC, 8:30 p.m.): When on a set visit for this show, we saw some pretty hilarious poems from tonight’s episode, which focuses on Tessa trying to impress, who else?, a new poetry teacher. We’re hoping those poems made it into the episode, so Brandon Nowalk can repeat them for us all. America’s Next Top Model (The CW, 9 p.m.): Guess what, everyone? Tyra Banks decided that what was needed to revive her flagging reality franchise was a giant injection of British people. Margaret Eby is there as a bunch of models from the British version of the show invade. One if by land, two if by sea! Modern Family (ABC, 9 p.m.): Phil Dyess-Nugent is there as Modern Family does an episode about how one of the characters was born on Leap Day and… good God, don’t comedy writers get together and discuss these things? I mean, at least Parks & Rec is on another network, but this is inexcusable! Happy Endings (ABC, 9:30 p.m.): In tonight’s episode, Colin Hanks guest stars as himself, but we’re betting he’s secretly got a special friend that only he can see. David Sims is about to learn that Dave is, in fact, a fictional construct created by these people and Colin Hanks to justify their need to kill. Psych (USA, 10 p.m.): Tonight’s episode just might feature an Indiana Jones joke or two. We’re only guessing that from the title, which you’ll probably have to think about for a bit: “Indiana Shawn And The Temple Of The Kinda Crappy, Rusty Old Dagger.” Kevin McFarland recommends the episode. Revenge (ABC, 10 p.m.): Did you see that Oscars promo for this show, which made it look like it’s filmed entirely in a black box theatre and is, indeed, just about the greatest thing ever filmed? Carrie Raisler saw it, and she’s ready for everybody to start killing each other like something out of a Greek tragedy. Avatar: The Last Airbender (11 a.m.): Remember the thing where we told you this was going to be up yesterday? Yeah, we apparently lied about that. Hayden Childs will be back to cover the show for you this morning, and we promise that it will be filled with wacky fun for parents and kids alike. Carnivàle (1 p.m.): We’ve spent all that time among the carnival folk these last two weeks. Now, it’s time for Brother Justin to get his due, as today’s episode looks into the back-story of the preacher who makes being scared of preachers seem like the most natural thing ever. Todd VanDerWerff cowers. Alias (3 p.m.): Hey, wait a minute? What happened to Irina Derevko? That’s what you might be wondering if you’re watching this season for the first time. Fortunately, Ryan McGee has caught up with the episodes that answer that question handily. As it turns out, she was just out grocery shopping. Dumbest Stuff On Wheels (Speed, 8 p.m.): There’s no program description for this one, so we’re just going to assume that the “dumbest stuff on wheels” includes a bunch of random things, like a giant, fiberglass duck; an elaborate system of pulleys and levers; and a genuine replica Mario Kart. The Loving Story (HBO, 8 p.m.): Didn’t catch this HBO documentary about the landmark legal decision that made interracial marriage legal throughout the United States when it debuted earlier in the month? No worry! Tonight’s your chance to catch up on what Loving vs. Virginia accomplished for civil rights. Sons Of Guns (Discovery, 9 p.m.): It’s time for a new season of the show we refuse to learn anything about, even though we assume it has something to do with guns and possibly also sons. In tonight’s episode, we’ll imagine that guns are fired, and fathers have heartfelt talks with their sons. Aww. CSI: Crime Scene Investigation (CBS, 10 p.m.): If you’re looking for something to watch tonight that won’t tax the ol’ brain all that much but still sounds fun, Ted Danson and the gang having to deal with a blackout forcing them to rely on “old school” detection methods sounds like it might be a laugh. The Life Aquatic With Steve Zissou (IFC, 8 p.m.): Lots of people bag on this film, Wes Anderson’s fourth, but we think it’s pretty sublime, particularly the tricky, emotionally complicated final act, which zigs and zags through so many crazy turns that it feels like a movie unto itself. We think you just might love it. Role Models (FX, 8 p.m.): Or you could just check out this Paul Rudd and Seann William Scott vehicle, which tells the story of two friends who end up pressed into service in a Big Brothers type program. It’s mostly just a vehicle to watch little kids say crude things, but it’s pretty good as a vehicle for that. NBA Basketball: Bulls at Spurs (ESPN, 9 p.m.): Apropos of nothing, our wife just hates the Spurs. Hates ‘em, hates ‘em, hates ‘em. Conversely, her favorite team is the Bulls, so we suspect we know what she’ll be rooting for tonight, if she can be bothered to tune in. A bloodbath, we imagine. Horrific and bloody. White Collar (Tuesday): Kenny Herzog has the details on another season finale of White Collar, which we didn’t realize was ending so quickly. At least it will declutter what might be TV’s most competitive time slot, but we’ll miss all the breezy capers and wacky banter between Tim DeKay and Matt Bomer.